Federation of International Lacrosse is proud to announce that Gladiator Lacrosse will provide the Official Goals at the FIL Men’s World Lacrosse Championship to be played in Netanya, Israel in July 2018. 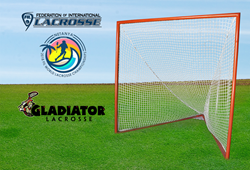 The Federation of International Lacrosse has announced Gladiator Lacrosse, a premier name in the sport, will be the provider of the Official Goals for the 2018 World Lacrosse Championship that will be played in Netanya, Israel from July 12 through July 21, 2018. The Federation of International Lacrosse has announced Gladiator Lacrosse, a premier name in the sport, will be the provider of the Official Goals for the 2018 World Lacrosse Championship that will be played in Netanya, Israel from July 12 through July 21, 2018. All 25 fields being used for competition during the World Championship will be adorned with Gladiator Lacrosse Professional Goals and Nets. This new partnership is a shining example of just how committed Gladiator Lacrosse is to help players train and excel in the sport globally. “The Federation of International Lacrosse and Gladiator Lacrosse both strive to make the game accessible to wider audiences and we look forward to leveraging the partnership to help grow our brand internationally,” said Rachel Zietz, CEO and Founder of Gladiator Lacrosse. About 2018 FIL Men’s World Lacrosse Championships (WLC): The 2018 WLC will be the 13th edition of the international men’s field lacrosse tournament organized by the Federation of International Lacrosse. The event is held every 4 years and the 2018 edition will see 48 nations compete for the gold medal this summer in Netanya, Israel, making this World Championship the largest of all-time. To learn more about the event, please visit http://worldlacrosse2018.com/ and the tournament’s social media pages: https://www.facebook.com/worldlax2018/ on Facebook and https://www.instagram.com/worldlaxchampionship2018/ on Instagram. About Federation of International Lacrosse (FIL): The FIL is headquartered in New York City and is the international governing body of lacrosse, responsible for men’s, women’s, and indoor versions of the sport. They organize the Men’s World Lacrosse Championship, Women’s Lacrosse World Cup, the Under-19 Men’s and Women’s World Lacrosse Championships, and the World Indoor Lacrosse Championship. To learn more about the FIL, please visit https://filacrosse.com/ and their social media pages: https://www.facebook.com/FILacrosse/ on Facebook and https://www.instagram.com/federation_of_intl_lacrosse/ on Instagram. About Gladiator Lacrosse: Gladiator Lacrosse, founded in 2013, established by then-13-year-old entrepreneur and lacrosse player Rachel Zietz, is currently one of the leading manufacturers of professional grade lacrosse equipment. Recognized by Florida’s Governor Rick Scott in his 2016 State of the State address and by Time Magazine as one of the 30 most influential teens of 2016, Gladiator Lacrosse and its founder have been featured in many publications including: The New York Times, South Florida Business Journal, Entrepreneur Magazine, Fortune Magazine, and Inc.com. Gladiator Lacrosse was also the first lacrosse company to appear on ABC’s hit television show, Shark Tank. To learn more about Gladiator Lacrosse please visit, http://www.gladiatorlacrosse.com/ and their social media pages: https://www.facebook.com/gladiatorlacrosse/ on Facebook and https://www.instagram.com/gladiatorlax/?hl=en on Instagram.